As Alaska warms and permafrost thaws, the chemistry of the Yukon River’s water is transforming chemically, new research from the U.S. Geological Survey shows. Long-term monitoring reveals that levels of calcium, sodium, phosphorus, magnesium and sulfates are increasing in the river’s waters, according to a new study led by the USGS. That is evidence of widespread permafrost loss, which has allowed water to flow freely through thawed, mineral-rich soils and carry some of those minerals into the river. The results indicate a profound transformation in the Yukon River basin, an area twice the size of California and a major contributor of water into the Arctic marine system, said the lead author of the study, which was published in the journal Geophysical Research Letters, a publication of the American Geophysical Union. “We’re having a big-time change in hydrology over that whole basin,” said Ryan Toohey, an Anchorage-based USGS scientist. The findings use data from one site at Pilot Station on the Yukon River and one at Nenana on the Tanana River, a major Yukon tributary. Both sites have been USGS monitoring stations for decades, allowing this study to reach back to 1982 to investigate trends. Not only did overall levels of the five chemicals increase substantially from 1982 to 2014, but timing of the releases expanded as well, according to the findings. While most of the releases happen in the summer, the biggest percentage increases for some of the chemicals have been either in late spring or in the fall, indicating earlier annual thaws and later annual freeze-up of soil over time. The study is part of a broader USGS program, undertaken in cooperation with the Yukon River Inter-Tribal Watershed Council, which represents Native residents in Alaska and Canada, to better understand the Yukon River. The iconic waterway runs nearly 2,000 miles from the mountains of British Columbia to the Bering Sea and is one of the world’s major Arctic rivers. Just what will be the effects of the chemical changes measured by Toohey and his colleagues is yet unclear. Increased loads of one of the minerals tracked, sulfates, have some potentially ominous implications — the specter of a chain reaction that could create more poisonous methylmercury in the river’s water. Sulfates are consumed by bacteria that convert simple elemental mercury into more-dangerous methylmercury form, which is more easily accumulated in fish. The role of sulfates in methylmercury production has been documented, in past studies in Minnesota and China, for example. Meanwhile, permafrost thaw in the Yukon River basin has been releasing once-frozen but naturally occurring elemental mercury into the watershed, past USGS research shows. Among the major Arctic rivers, the Yukon has some distinguishing characteristics. It flows east to west, a little different from the south-to-north flows that dominate the other rivers. It flows into the Bering Sea of the North Pacific, rather than directly into the Arctic Ocean. And unlike the other major Arctic rivers, the Yukon does not have a total freshwater discharge that is increasing as the climate warms. The five biggest Arctic rivers — the Mackenzie of Canada and three great Siberian rivers, the Lena, Ob and Yenisey, as well as the Yukon — are considered sentinels of climate changes. All have been watched carefully by scientists, though there are challenges of remoteness, harsh conditions and, for the Yukon, transboundary complications. Scientists are also challenged by gaps in the written historical record. But for the Yukon, some important historical information is available that was accumulated for what were originally non-scientific purposes. The Nenana Ice Classic, a charity betting pool that allows people to guess the ice-breakup date of the Tanana River in the town of Nenana, has provided valuable information about historic ice melt. 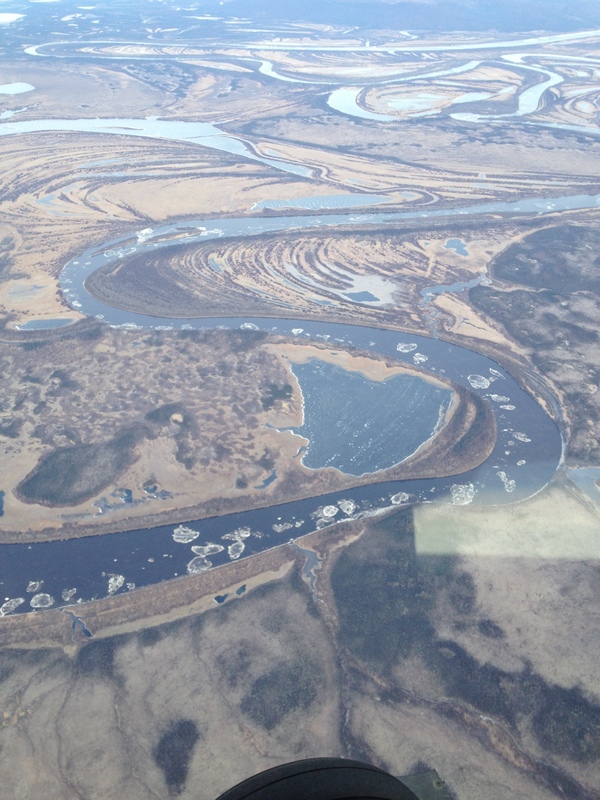 A similar tradition, dating back to 1986, has provided a long record of Yukon River ice-breakup dates in the Canadian town of Dawson; last year’s April 23 breakup was the earliest ever recorded in the Yukon Territory town. Research by the Alaska-Canada Yukon River Inter-Tribal Watershed Council has been crucial to understanding changes in the river and its region, said Toohey, who worked at the organization before coming to the USGS. Through that council, citizens along the river have been monitoring conditions and taking water samples that are collected and analyzed in a consistent manner, Toohey said. Citizen participation varies a bit with funding but the watershed council has residents of up to 54 villages taking part in the program, said Edda Mutter, science director for the organization and a co-author of the study on river chemistry. Generally, at least a couple of residents in each village take samples and some have been doing so for about 10 years. Advancing erosion is putting more soil sediment into the river, sometimes clogging drinking-water filter systems. Permafrost thaw and erosion go together. And the thaw is triggering other changes on the surface, drying out some areas and bringing additional water to others. The increase in river sediment and debris is fueling concerns in the villages, said Mutter, who spent three weeks floating on the upper Yukon and meeting with local residents last summer. “Everyone is very nervous about salmon and salmon habitat,” she said.